Poultry farmers are responsible for the daily care of chickens, turkeys, ducks, or other poultry species that are raised for meat production purposes. Approximately nine billion broiler chickens and 238 million turkeys are consumed in the U.S. each year. These birds are raised in over 233,000 poultry farms, many of which are small-scale operations. Poultry producers work in conjunction with veterinarians to ensure the health of their flocks. Livestock feed sales representatives and animal nutritionists may also advise poultry producers on how to create nutritionally balanced rations for their facilities. As is the case with many animal farming careers, a poultry farmer may be required to work long hours that can include nights, weekends, and holidays. Work may be carried out in varying weather conditions and extreme temperatures. Workers may also be exposed to diseases that are commonly found in poultry waste products, such as salmonella or E. coli. Most poultry farmers raise one species of fowl for a specific purpose. Nearly two-thirds of poultry revenues come from the production of broilers, which are young chickens raised for meat. Approximately one-quarter of poultry revenues come from egg production. The remaining poultry revenues are derived from the production of other species such as turkeys, ducks, game birds, ostriches, or emus. According to the USDA, most U.S. poultry farms involved in meat production are concentrated in the Northeast, Southeast, Appalachian, Delta, and Corn Belt regions, which places them in close proximity to the majority of poultry processing centers. The state with the highest number of broiler farms is Georgia, followed by Arkansas, Alabama, and Mississippi. The U.S. is the second largest exporter of broilers, second only to Brazil. Most farms that produce broilers are large commercial operations involved in indoor broiler production. Other types of broiler farming are free-range broiler production or organic broiler production. Many poultry farmers hold a two- or four-year degree in poultry science, animal science, agriculture, or a closely related area of study. However, a degree is not necessary for entrance to the career path. Coursework for these animal-related degrees can include poultry science, animal science, anatomy, physiology, reproduction, meat production, nutrition, crop science, genetics, farm management, technology, and agricultural marketing. Many poultry farmers learn about the industry in their younger years through youth programs such as Future Farmers of America (FFA) or 4-H. These organizations expose students to a variety of animals and encourage participation in livestock shows. Others gain hands-on experience by working with livestock on the family farm. The income a poultry farmer earns can vary widely based on the number of birds kept, the type of production, and the current market value of poultry meat. The Bureau of Labor Statistics (BLS) reports that the median wage for agricultural managers was $68,050 per year ($32.72 per hour) back in May of 2014. The lowest earning tenth of agricultural managers made under $34,170 while the top paid tenth in the category earned over $106,980. Chicken manure may also be collected and sold to gardeners for use as fertilizer, which can serve as an additional source of revenue for poultry farmers. 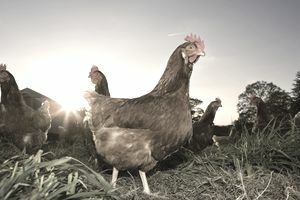 Many smaller non-corporate poultry farmers engage in other agricultural enterprises on their farms–from raising crops to producing other livestock species–to provide additional income to the farm. Poultry farmers must factor in various expenses when calculating their total earnings. These expenses may include feed, labor, insurance, fuel, supplies, maintenance, veterinary care, waste removal, and equipment repair or replacement. The Bureau of Labor and Statistics predicts that there will be a very slight decline of about 2 percent in the number of job opportunities for farmers, ranchers, and agricultural managers over the next several years. This is due primarily to the trend towards consolidation in the farming industry, as smaller producers are being absorbed by the larger commercial outfits. While the total number of jobs may show a slight decline, the USDA’s industry surveys indicate that poultry production will post steady gains through 2021 due to increasing demand for broilers.